VIDEO: Cavaliers vs. Raptors Game 4 Full Highlights - 2016 NBA Eastern Conference Finals - Balita Boss! 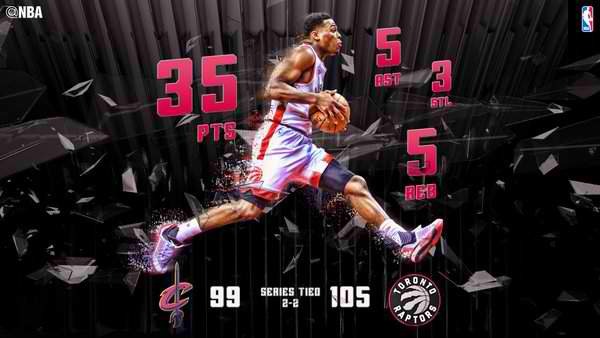 NBA stars Kyle Lowry and DeMar DeRozan led Toronto Raptors to a Game 4 victory over Cleveland Cavaliers in the 2016 NBA Eastern Conference Finals. Lowry scored 35 points on 14 of 20 shooting. He also had 5 rebounds, 5 assists and 3 steals. DeRozan had 32 points for Toronto, 12 in the third quarter, registering back to back 30+ point games for the first time in his Playoff career. The Raptors' backcourt duo shot a combined 28-for-43 for 67 points, their most combined as teammates. DeMarre Carroll scored 11 points and Bismack Biyombo had 14 rebounds for Toronto. LeBron James, who played the entire second half, scored team-high 29 points, grabbed 9 rebounds and dished out six assists. Kyrie Irving had 26 for the Cavaliers, who trailed by as many as 18 points. The series is now tied at 2-2 and shifts to Cleveland for Game 5 on Wednesday (Thursday in the Philippines).